In the last installment we introduced the classification scheme in which the ragas of Hindustani classical music are grouped into ten parent families called thaats. Little is to be gained by my describing these thaats and listing the ragas that belong to each; this information is now readily available on scores of websites (one relevant to this topic is here). I prefer to share my own explorations of this schema in the hope that some readers would come up with insights that have eluded me thus far. Personally, and this is surely a function of my ignorance, I haven’t found the schema to be of much use (because of its many exceptions) asides from the help it provides in identifying closely related ragas. For example, I know that Darbari, Adana and Jaunpuri are aesthetically similar because they have all been grouped under Asavari thaat. Still, I have remained fascinated with what I feel might be hidden secrets of the scheme. Based on our simplification (dropping the shudh category), we should label [r g M d n] as the komal swaras and [R G m D N] as the tivra swaras. For a visual display, however, I want all the komal swaras to be represented by small case letters and all the tivra swaras to be represented by upper case letters. In order to achieve this objective I need to make (for this discussion only) one exception to the accepted written notation – in the case of Ma we will let m represent the komal equivalent and M represent the tivra equivalent. There is one last notational detail before we move to the exploration of the thaat schema. Since Sa and Pa are common to all thaats and are invariant, we do not need them to identify thaats – their presence is assumed. Now I am going to identify the 10 seven-note thaats by means of the five notes that have variants and mark them on what I have called the Circle of Thaats. Our starting point is Kalyan Thaat in the 12 o’clock position with all tivra swaras – RGMDN and our concluding point is Bhairavi Thaat, its mirror image, in the 6 o’clock position with all komal swaras – rgmdn. Moving anti-clockwise from Kalyan, we change tivra swars to komal swaras, in turn, to get the following three thaats before we arrive at Bhairavi thaat where all swaras become komal. Marwa [rGMDN]; Poorvi [rGMdN]; Todi [rgMdN]. Moving clockwise from Kalyan, we change tivra swaras to komal swaras, in turn, to get the following four thaats (ignore Bhairav thaat for the moment) before we again get to Bhairavi thaat where all swaras become komal. Bilawal [RGmDN]; Khamaj [RGmDn]; Kafi [RgmDn]; Asavari [Rgmdn]. In the anti-clockwise direction, Ma and Ni remain tivra in all three thaats. The variation comes from transformations in Re, Ga and Dha. In the clockwise direction, Re remains tivra and Ma remains komal in all four thaats. The variation comes from transformations in Ga, Dha and Ni. When we get to an exploration of ragas we will find that Re and Dha go together a lot, as do Ga and Ni. In each pair one note belongs to the lower half of the saptak and one to the upper half. We might also find this presentation useful when we discuss the relationship of ragas to the time of day. The combination of komal and tivra swaras will be important determinants of the rasa of a raga and hence of the appropriate time for its performance. 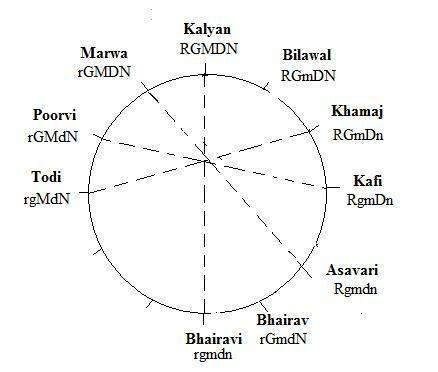 Bhairav thaat [rGmdN] is an outlier in this schema – it does not really fall neatly on either side between Kalyan and Bhairavi thaats. Eight thaats pair up in four pairs that are mirror images of each other (the swara that is tivra in one is komal in the other): Kalyan [RGMDN] and Bhairavi [rgmdn]; Marwa [rGMDN] and Asavari [Rgmdn]; Poorvi [rGMdN] and Kafi [RgmDn]; Todi [rgMdN] and Khamaj [RGmDn]. Bilawal [RGmDn] and Bhairav [rGmDN] are orphans; they are unpaired thaats. I keep toying with this (surely naïve) thought that becomes a scientist but perhaps not a musician that this schema is unsymmetrical and there must be a way to restore symmetry to it. We could either add two new thaats, [rgMdn] and [RgMDn], to create pairs for Bilawal and Bhairav and to get to 12, a number much more amenable to symmetrical divisions. Or we could drop the existing Bhairav and create a new thaat [rGMdN]. The existing thaat classification has many ambiguities. For example raga Charukeshi [SRGmPdn] cannot be placed unambiguously in any thaat. One has to listen to its movements before assigning it to one family or another. In the last installment we employed the same logic of aesthetics to assign Bhupali and Deshkar (ragas with the same swaras) to different thaats. Given these ambiguities, I keep wondering if the classification can be subject to rationalization by someone who knows both the mathematics of sets and the theory of music. Perhaps this is idle speculation but I find it an entertaining way to spend time and stay out of trouble. This entry was posted on September 16, 2010 at 1:15 am and is filed under Music. You can follow any responses to this entry through the RSS 2.0 feed. You can leave a response, or trackback from your own site. Right you are (about thaat and time theory classifications lacking in logic or symmetry) but “staying out of trouble”? I GOT into trouble, trying to analyse/ explain the classification, especially when one tries to find parent thaats or time slots for ragas imported from Carnatic music (Charukesi,Simhendramadhyama, Malayamarutam, Vachaspati, Nagaswaravali) Why dont we just accept that the time theory classification is / was arbitrary, and leave it at that ? The late ustad Amir Khan was once at All India Radio studies in Delhi (late 1940s)when he was asked to record Marwa at 11 AM. The broadcast was for 5.30 PM but the accompanists were to go off duty by lunchtime, after the live morning broadcast (for which he sang Ahirbhairav) ,so the evening slot was to be recorded. Khan saheb refused to sing Marwa at 11 AM. This led to a long controvsery about how, under the artificial lights inside a studio, the time of day has no meaning, because it is the same whether it is 11 AM or 6 PM. So how do we justify “matching the mood of the swaras in a raga, to the ambient mood of the time of day” which is the justification for the time theory? After 25 years of discussions, I still dont have a satisfactory explanation…my students sing Deshkar and Bhupali during morning classes. No point in telling them that according to the shastras anyone singing a raga out of its allotted time, will go to hell (interestingly, that same ancient text, also adds a caveat, that it is OK to sing a raga out of its time, provided it is a “Raja agnya” or royal command….!!! In Carnatic music we sing Kalyani and Hamsadhwani in the morning, so why does the time theory not apply there ? Sakuntala: I meant that it helps to keep me occupied and out of mischief. Of course, I could get into trouble with the experts but fortunately I am so insignificant that nobody bothers. You are in a different category being an expert yourself. I share your feelings on the seeming arbitrariness of the thaat and time classifications. Still, I can empathize with the logic of the latter. There is something that corresponds to the rhythms of the body. If someone drops in at 7 in the morning and asks me to go disco dancing I would find it impossible. Similarly being invited to meditate at 7 in the evening would be out of joint with the rhythm of my body. I agree that artificial lighting in a studio obscures the natural distinctions of night and day but the distinctions persist in the clock of the body. So, despite the fact that I don’t understand the points of theory, I still find that Bhairav, Multani, and Yaman come across better in the morning, afternoon and evening, respectively. I once asked an Ustad why he started his own children off with Bhairav and the children of others with Yaman thinking that he was keeping something back from the latter. His reply convinced me otherwise: he said, he taught his own children in the morning and the children of others in the evening. Sunita Deshpande’s article on Mallikarjun Mansur narrates an anecdote related to this. She says when Mansur was once staying at their place, she asked him about the time allocation for raaga-s and he told her he didn’t think those allocations made much sense. At an open interview with Mansur that evening, someone asked him the same question, and Deshpande expected him to give the same response, but Mansur ducked the issue: he said, IIRC, that he followed the time cycle but that if someone else chose not to follow it, that was upto them! She talks of feeling shortchanged and of later accosting Mansur, but he just laughed it off as not being very important. The problem as I see it is not so much a matter of classification by combinations of notes but rather classification by the mood of the raga. As I had said earlier, this amounts to an emphasis on semantics (i.e. what the raga is about) than on syntax (i.e. the building blocks of the raga in the notes etc.). Of course, the notes are there to create the mood so they will inevitably figure in the classification. The real problem seems to be that mood is a very intangible thing and may even be partly subjective. So that makes the problem of classification quite hard. How does one judge how close two ragas are in mood? Arun: I agree. I had mentioned earlier my conjecture about the classification system in the Hindustani tradition – that it was primarily an effort at grouping ragas related in aesthetics and spirit to each other. The syntactic overlay came later and was not very convincing. Actually, it is not hard to discern when ragas have different expressions – listen to Darbari and Jaijaiwanti, for example, and you can tell immediately that they are not related. But listen to Darbari and Jaunpuri and you will recognize the relationship. So the semantic classification is very useful in this sense. This also suggests a test to judge how close two ragas are in mood. If during a performance, a performer slides from one raga to another without the audience catching on, one can attribute it to a similarity of moods. This is also the underlying logic of the form called Ragmala – the performer starts from one raga and moves through a number of related ones without compromising the integrity of the performance before coming back to the point of departure. It should make you cry and feel utterly blissful at the same time. Arun, I wish I could sit next to you, listen to the video in 10 second intervals and hear you talk about how you enjoyed it. That is the only way I can learn to appreciate hindustani music aesthetically. Vinod: Appreciation is not the same thing as enjoyment. I would not generate this pressure that you MUST feel some great spiritual sense of being overwhelmed or else something is lacking in you. Enjoyment is very subjective and it is quite alright if you don’t share that experience with others. Personally, I just follow what the artist is trying to accomplish – sometimes I admire the performance, most times it has no emotional impact. I agree that it is possible to simply hear ragas and classify them as similar or different and perhaps this might suffice. What I was wondering was whether there is some way to write down in some notation the effect of a raga and then do the classification based on this notation just as the current system has a system of notation for the different notes and then classifies them accordingly. This would remove any possible subjectivity in the method based on listening. Arun: This looks like an exercise in pattern recognition and with so many advances in the field I would be surprised if this remains an impossible task. A whole lot of path breaking work is being done with computers in the Western classical tradition. It seems to me a question of someone becoming interested enough to start playing around. I’m not saying it is impossible but some breakthroughs are required to get it off the ground. Some computer scientists from France visited Bombay a decade ago to do something like this but they didn’t get very far. Image recognition is still struggling with fundamental issues. On the other hand, as you had pointed out some time ago, David Cope has managed to figure out how to compose Bach-like partitas with computers. But his effort was unique and, to my mind, quite remarkable. The rasa theory of Bharata and Abhinavagupta, while an advance on Aristotle, is still too coarse-grained to help. But just as the semantics of “The glass is on the table” depends on the all six words in the sentence and on the context, so does the semantics of a musical phrase depend on its parts and the context. Four things are required: to find a way of representing semantic values of notes in some notation, to identify the semantic value of each part of a phrase, to identify how to combine the semantic values of parts into a semantic value of the whole phrase and indeed raga, and how to measure the distance between respective semantic values by embedding them in a suitable metric space. This is nontrivial. On the other hand, it is possible there are other approaches that might make the problem simpler where one is simply identifying things like isomorphisms between characteristic phrases of ragas, for example, between sa-re-sa and pa-dha-pa, and so on. This could also possibly work. But the explicit semantics or aboutness or capturing of mood seems to be missing here though maybe it is arguable that it gets captured somehow. I simply do not know enough about ragas to say. A third approach might be to use statistical techniques from the field of machine learning. This might be the easiest method. Arun: I am not sufficiently up on these techniques to say much with confidence except that the rate of change is huge. Ten years could be a long time in these fields. I was going by the work of David Cope and thinking that someone could experiment in a similar way with Indian music. Given that Indians are at the cutting edge of hardware and software, it should only take a little bit of initiative to engineer the link with music. Something might already be going on. We need to ask around. I agree. Maybe someone is already doing this. This version is from the movie Gaman with the beautiful Smita Patil though the song is almost a century old, I think. I hope you didn’t feel any pressure from my suggestions. That was not the intention. Since you like physics, here is an analogy that might suggest a way to think about the relationship of more popular music to classical music. It is very inexact but here it is: if you see someone ice skating and initially she has her arms outstretched and later she draws them in, she will start rotating rapidly. Most people are familiar with this sort of maneuver. One can enjoy both the change in motion at the level of perception as well as appreciate the principle of conservation of angular momentum that makes it possible. The perception is immediately enjoyable but the more abstract physics takes some effort to enjoy. It is similar with popular music and classical music. But whether one wants to make the effort or not is of course purely a personal matter. I am curious about instruments. It appears that reference frequency is immaterial and can be anything depending on comfort of the vocalist. But instruments like piano are set to fixed frequencies. How have we arrived at these frequencies? Anil: In music absolute frequencies have no meaning; the key is the musical interval between notes. It is the same for instruments. However, for the sake of standardization all pianos are tuned in the same way. The standard piano has 88 keys and by convention the 49th key (called A4) is tuned to the frequency of 440Hz. This is sufficient to fix the frequency of every other key. As we have discussed in this series, pianos use the equal-tempered scale in which each key is related to the next by a fixed ratio (the 12th root of two = 1.059463 – because there are 12 semitones in each octave and frequency doubles for every octave; thus the frequency of the note A in the 5th octave, A5 will be 880 Hz; multiply 1.059463 by itself 12 times and you will get 2). The advantage of the equal-tempered tuning (which sacrifices some integrity of sound compared to more exact tuning) is that the instrument does not need to be retuned when the reference key is shifted for any reason. A singer can start from A4 or G4 without there being need to retune the piano because all intervals are the same with equal-tempered tuning.